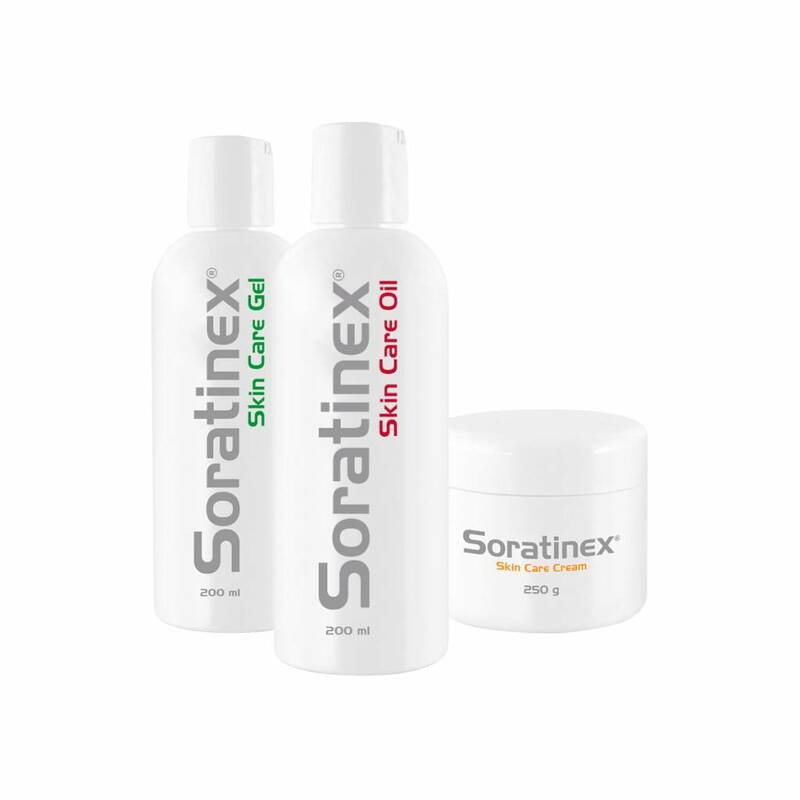 Soratinex Medium Set contains 100g Skincare Cream (2x50g), 200ml Gel and 200ml Oil. 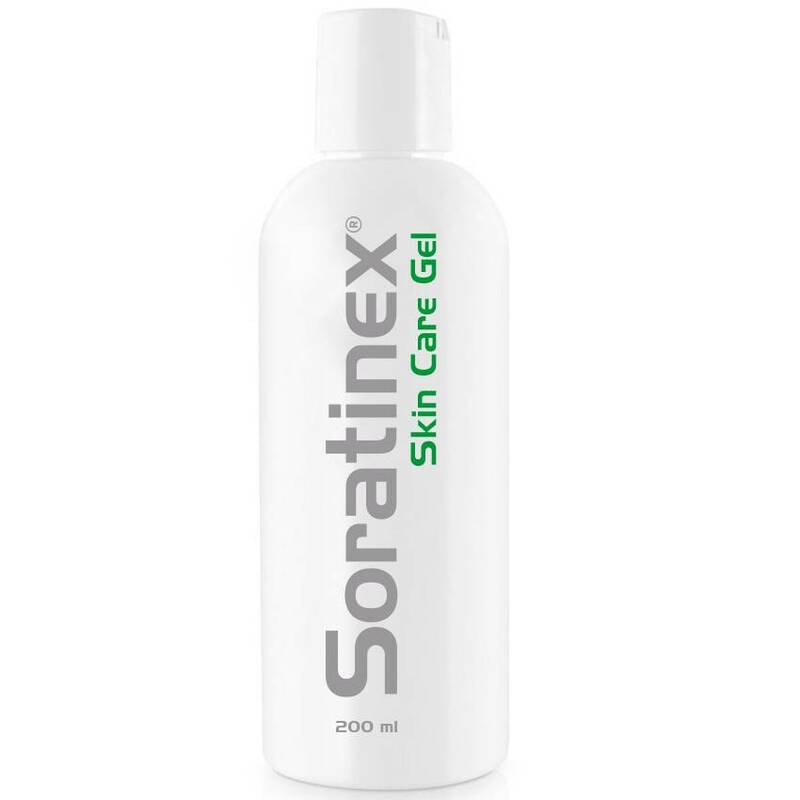 SORATINEX Cleansing Skin Care Gel contains natural fruit acids 200ml. 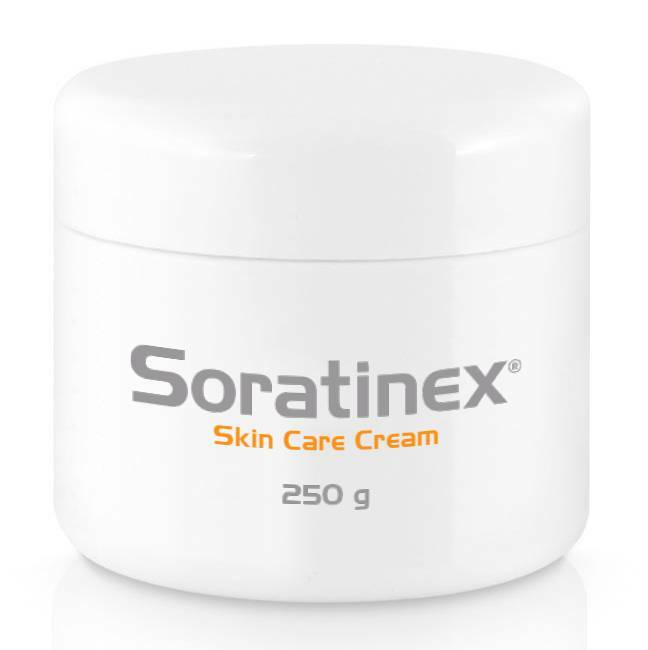 SORATINEX Skin Care Cream 100g. 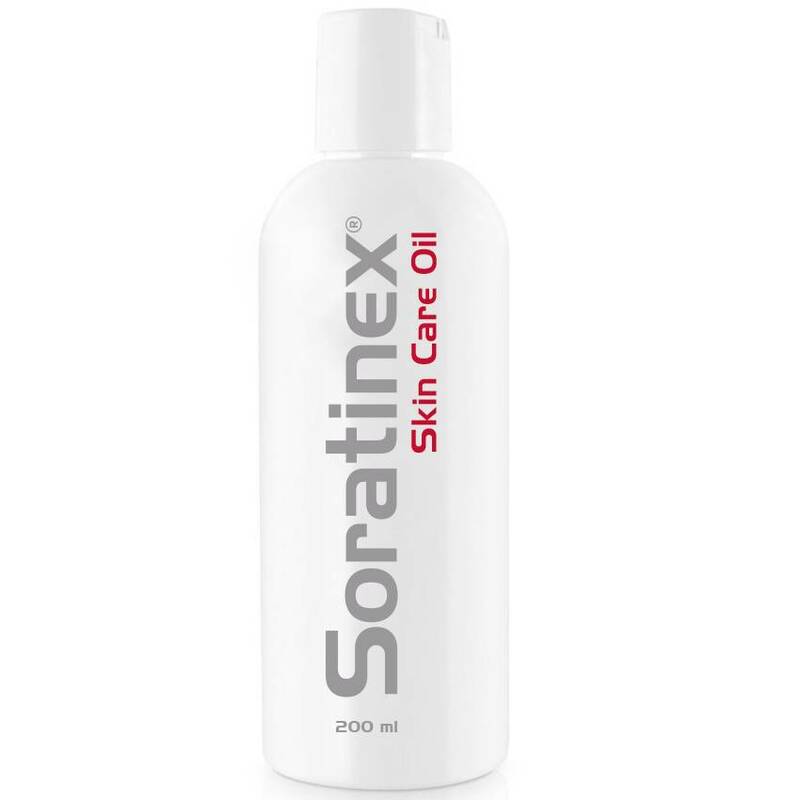 SORATINEX Skin Care Oil contains natural essential oils which help to hydrate the skin 200ml. 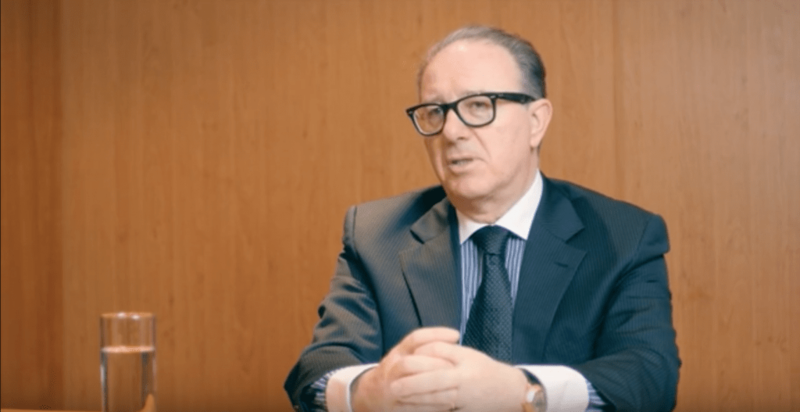 To eliminate the symptoms of chronic plaque psoriasis, all three products should be used for the duration of the treatment. In the morning, moisten the affected area (deposit) and coat it (preferably using a small sponge and treating the deposit only) with cleansing gel; leave for 3-10 minutes, then rinse thoroughly with lukewarm water and wipe dry. This phase removes the so-called dandruff. 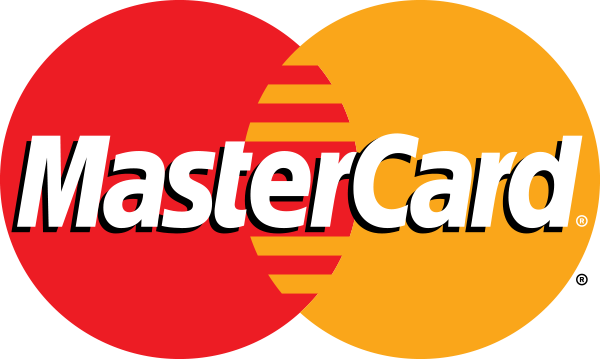 The skin will become smoother over time. After washing off the cleansing gel and wiping the skin dry, coat the treated deposits with cream and let it take effect for about 10 minutes. The cream helps to reduce inflammation in the plaque. Thinly coat the cream treated skin with body oil; it will hydrate the skin and form a protective film on the coated surface and enhance the effect of the cream. In the evening, wash your hair using the cleansing gel (just like a shampoo) and leave for 10 minutes. Then dry the hair as usual with a towel or a hairdryer. Coat the affected areas (deposits) with cream. After application of the cream, coat the deposits with the body oil. Neither the cream nor the body oil will stain or colour your linen. In the morning, wash your hair again using the cleansing gel (just like a shampoo) and dry the hair. Unlike the evening routine, do not apply the cream and body oil, otherwise your hair will be left looking greasy. 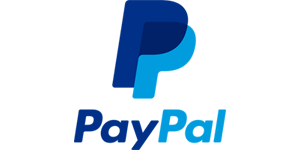 For detailed information please check the folder Use of Soratinex preparations and the information on the packaging.